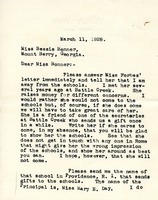 Berry sends instructions to Bonner, including finding the name of a Providence school that sends donations and a big advertiser she in Europe, writing everyday with "all the little details about the work," and composing an answer to a letter from Miss Forbes. While she prefers that Miss Forbes not visit the schools, if she does, Bonner should prevent her from getting in touch with anyone in Rome that might give her the wrong impression about the schools. 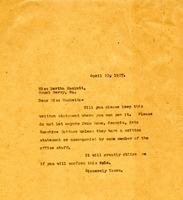 Berry instructs Hackett not to let anyone from Rome, Georgia into Sunshine Cottage unless they have written permission or are accompanied by a member of the office staff.